That rooster is so beautiful - he definitely deserves a green smoothie - along with the pizza! I bought a Breville juicer from Amazon about 6 months ago. I absolutely LOVE it and use it all the time. Really sturdy, really easy to clean, juices up everything. Highly rated and highly recommended. My favorite combo: lettuce, cucumber and melon. I head romaine, 1 whole cucumber and half a melon - any kind - cantalope, honeydew, watermelon or whatever you've got. I had a Waring juicer for many years and it was great for carrot/apple juice. Since it held back the pulp it was less great for pears and softer fruit. And it got very grungy under the bowl and I never could get it apart to clean it. I also had a citrus attachment with it which was great for fresh OJ. I finally broke down and bought a VitaMix == $$$$$ == big bucks but I'm not a bit sorry. I've only used it for smoothies (fruit mostly, a much greater variety than the Waring) but it does lots else. Really easy clean up. I'm loving it and am consuming lots more fruit plus spinach and kale. I really enjoy your blog and the pics of the animals. I had a Breville, one of the nice models... used it maybe twice? Clean-up is quite a chore with these appliances and they are too big to leave sitting on the counter all the time too, sooooo I eventually sold it on Ebay right after the holidays when everyone's thinking about dieting and eating good. Got my initial investment ($150) right back out of it! Isn't it funny though - everyone perceives things differently. I notice Anonymous says that hers is easy to clean, LOL. Your rooster's expression is cute - similar to our horses' and dogs' expressions most of the time. Demanding lil buggers, aren't they?! I've had a Vitamix for oh 8-9 yrs. It doesn't separate the pulp like a juicer, but it blends everything up so you can drink it all. The other month at Costco I saw a Vitamix demo where they put grapes-vine, stems, and all-in with a rainbow of produce for a very tasty smoothie. Love green smoothies, have wheat berries. What next? I bought a Breville (I think the 850 watt model) from newegg this summer when it was a Shell Shocker deal. I LOVE IT! I have been juicing celery to conquer high blood pressure - and it works - but that is a whole 'nuther story. Anyway, my favorite combo is a whole stalk of celery (not just a rib), 3 carrots and an almost-over-the-hill apple for some sweetness. The color isn't too appealing but the taste is soooo fresh! Love your blog! I have an Omega juicer, a Jack LaLanne juicer, and a Vitamix but I recently splurged and got a Hurom slow juicer and I LOVE, LOVE, LOVE it! I definitely recommend it. I do not have a juicer but I might have to look into one. I would love to get more fruits in my body. It is so hard to keep fresh fruits in the house for any length of time with just one person here. Guess the darn goat would share with me. Keep us posted if you get one and what kind. Have a super day. We have a Jack LaLanne Power Juicer that we just love. $99 from Target about 5 years ago, and it still works great. It's a little bit of a pain to clean, but I think they all are. It's so worth it for the fresh juice! If it broke I would run out that very same day and buy the very same thing, I'm that happy with it. Good luck! You'll wonder why you ever lived without a juicer, no matter which one you choose. I don't have a juicer. Which is kind of stupid, since I seem to spend half my summer stringing up my muslin juice bag for mulberries, blackberries, grapes . . . I really would like a juicer. I have a Jack LaLanne too. I use to use the thing a lot. Gotten too busy and don't do much with it at all now. I really only like juiced fruit though. he really is a handsome rooster!! Just made fresh carrot juice and OH it's so good. 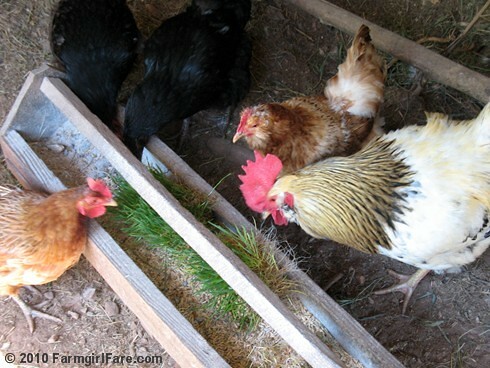 And I just found out that my neighbors got chickens, so I'm tempted to see if they'll grow wheat grass like this. Too cool! We just started juicing on a daily basis about a week ago. My husband came complete with the most fabulous kitchen appliances including a juice master (As Seen on Late-Night Infomercial). Yep... I married up. I don't own a juicer myself, but my boss does. The day she decided to juice us all up I learned that juicer juice is wonderful--the essence of fruit in a glass. If you get one, you'll probably be hooked. I'm very interested in your chicken food. I can't wait to hear about it! Will you share how you sprouted the wheat? 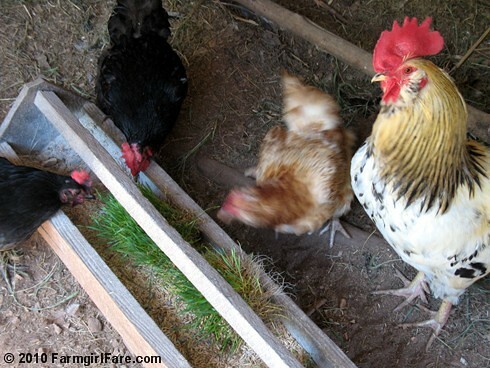 I am looking forward to your upcoming post on growing chicken feed. We just moved to the country about a year ago and have chickens for the first time. We are having a blast with them. We've had a Breville juicer for a few years now. It didn't get hauled out all that often until we made an effort to keep it in sight--and now we've got homemade hard cider to show for it. The motor on it is absolutely incredible! Well worth it. Can't wait to hear the step by step on how to grow my own! Love the pictures! Some of you are obviously big Breville fans, and this model, which is under $100, got hundreds of great reviews on amazon. I'll let you know if I get one and how I like it. In the meantime, I've been making 'green smoothies' (which, unlike 'juice fountain' sounds kind of funny to me) in this KitchenAid countertop blender I bought a couple of years ago. Wow, this thing is way more powerful than the 1940s (maybe 1930s!) Waring I'd been using. I've been combining fresh organic spinach, an apple, a splash of orange and/or unsweetened cranberry juice, a little honey, some water, and ice. You can drink a lot of spinach that way - and the blender is powerful enough to actually make it smooth. I blend the spinach with just a little liquid first, then add everything else. I've been meaning to try using Swiss chard, since I almost always have some growing in my kitchen garden. What's nice about the blender method is that you end up drinking everything - no pulp to toss out. As for juicing wheat grass, I was only joking about that with regards to the rooster. I've never grown wheat grass for myself or drunk the juice. But it looks like there's some interest in learning how to grow wheat grass (it's SO easy) not just for chickens, but for people, too. Again, thanks for all your comments and input. I found out about the nutritional differences between hard and soft wheat varieties [who knew there were so many different kinds? (hard wheats have more protein than the soft ones)]. I sprouted some of the hard red wheat, the feed store kind, and tasted it. It is mildly sweet. Nothing was green yet, but the part that would turn green had emerged. The only difference between the feed store wheat and the people wheat is thorough they were about removing "extra" stuff - there's some chaff in the feed store bags. I like the price of the feed store stuff a lot better. The chaff floats and skims right off. I have more ducks than chickens, but everyone chows down when I toss out sprouts.